Melbourne Heavyweight Jarrod Boyle jumped on a plane at the end of February and headed to Breda, Holland for a once-in-a-lifetime opportunity – to train at the Golden Glory Gym of K1 stars Semmy Schilt, Stefan Leko and Chalid ‘Die Faust’ Arrab under the auspices of legendary trainers Cor Hemmers and Ramon Dekkers. Here he talks to MICHAEL SCHIAVELLO about life in the cauldron of one of the world’s most successful and toughest gyms. SCHIAVELLO: What were your first thoughts when you stepped inside Golden Glory gym? BOYLE: My first thought was, ‘How hard can it be?’ I had slept a lot on the flight from Australia, so Cor asked if I wanted to train shortly after he picked me up. It seemed like a reasonable idea. The gym itself is not what you’d expect. It is actually Ramon Dekker’s gym and the Golden Glory team train there in the morning. Dekkers conducts his own classes at night. When I went in for the first time, the most striking feature is that the K1 posters on the walls carry the images of the guys skipping and stretching out beside you – most notably Chalid ‘Die Faust’ Arrab, but also guys like Ghokan Saki and Errol Zimmerman. 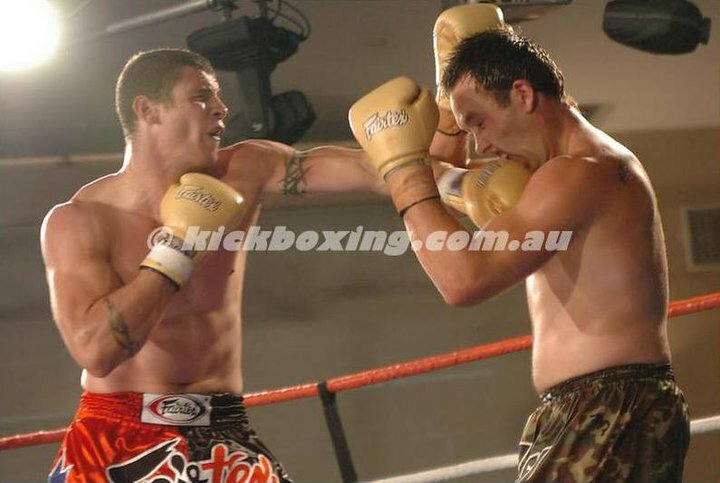 There is a host of other fighters there, none of whom are famous in Australia, but are extremely tough and exceptionally skilled. This was impressed on me during the first session. They wanted to see what I had which, disappointingly, wasn’t much. Lying on my back for the third time that session, I heard someone say, ‘Welcome to Holland’. SCHIAVELLO: You train with Cor Hemmers and Ramon Dekkers, what are their training styles like and how do they differ? BOYLE: Cor and Ramon use basically the same style. Lots of drills, lots of sparring and all of it hard. They don’t pay a lot of attention to injury or anything else, for that matter. These are the requirements and you either live up to them or you quit. SCHIAVELLO: How would you describe the style of training in Holland, as compared to Australia? BOYLE: The style of training is not that dissimilar to what I have experienced in Australia, except you are dealing with trainers and fighters of immense experience. Golden Glory is the ‘A Class’ fighting team, so there is no work on technique at all. You are expected to have that already. It’s basically drills and sparring; every session, 5 days a week. You need to be fit, you need to be conditioned and you need experience. The training develops your timing for both attack and defense and your ability to work strategically. SCHIAVELLO: Is there a secret in the way they train as to why the Dutch are the best in the world? BOYLE: I think there are a few things, not just in the way they train. For starters, there are more people doing it, involved in it and interested in it. There are lots of large people over here, hence Holland is famous for its heavyweights, but the Dutch produce world champions in every division. Because there are more people involved, it is far easier to get experience relative to your own level of experience. The top tier here is called ‘A Class’, which is basically premier league. If you are A Class, you are as good as the best in the world. Below this are B and C classes, and below that is the amateur league. Many fighters have had at least 30 fights before they reach A Class. Fighters such as Ghokan Saki have had as many as 65-70 fights over a ten year period, and he is only in his mid-twenties. SCHIAVELLO: Who are some of the guys you are sparring with over there and what have those experiences been like? BOYLE: I have sparred everybody at the gym and everybody is very capable! All really great athletes define their sport in their own way, and Chalid Arrab is one of those. Although a relatively ‘small’ heavyweight, he is as dangerous as they come. He knows how to get past another man’s reach and punch like crazy! Saki is extremely fast and agile and puts his combinations together beautifully. Errol Zimmerman will be the next one, I think, to become world famous. He can generate a phenomenal amount of power. His bones feel as if they are made of lead, both when you hit him and he hits you! Needless to say, all three have introduced me to the canvas repeatedly. SCHIAVELLO: Have you bumped into Semmy Schilt at all? BOYLE: I am yet to see the beast that is Semmy Schilt. As I understand, he trains at the other end of the country. The main stand-up gym is in Breda, the MMA faculty is in Almesfort, and Semmy trains wherever it is he lives. SCHIAVELLO: What is the atmosphere like at the gym? It’s the most successful K1 gym on the planet right now, is it just a buzz being inside it and part of it all? BOYLE: The atmosphere in the gym is very intense. Today (Wednesday 12 March) was a major day; the press were in doing an article on Alistair Overeem, so the gym was putting on a display. Almost all the really heavy fighters were there. To be in the gym when the crew is all warming up is an awesome sight, awesome to behold. Not only because you have so much talent in such a small space, but also because it has been purpose-built by Cor Hemmers. You are in the presence of one of the great coaches. While K1 is the focal point of international kickboxing, it is ‘sports entertainment’ and doesn’t necessarily showcase talent in the way that a ranked sport like tennis does. If you make it to A class in Holland, you are hanging with the world’s best. You can see the pinnacle of it at Golden Glory. SCHIAVELLO: What are some of the common drills they work you on? BOYLE: The first part of the session is drills. It’s basically like holding pads for one another. You throw your combination to the other person’s mitts and body, intensity depending on your partner’s ability and condition. The objective is to deliver strikes to a human body and, in turn, absorb them for conditioning purposes. The combinations are basically the same as the ones I have done in Australia. L jab / R round and so on. They get strung out to become more complex, for building fitness, balance, and co-ordination. The second part is sparring. Which is as close to actual fighting as possible. SCHIAVELLO: Any chance you’ll get to fight in Holland under Golden Glory? BOYLE: Cor is looking for a suitable opponent for me at the moment, so hopefully I’ll get an opportunity soon. Patrick on ABC FM: Do Combat Sports Encourage Violence or Teach Respect? Jim Watson on Do My Abs Look Big In This? Kiwilistener on Do My Abs Look Big In This?